Place the floor mat (if fitted) to one side. To open, pull the lid up from the centre (arrow) at the rear. To close, press the lid down. 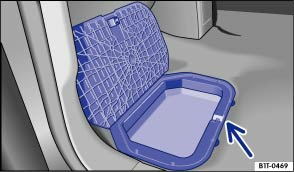 If the vehicle is equipped with a stowage compartment on the vehicle floor in front of the second row of seats, the stowage compartment cannot be used as intended. It must be filled with special accessories so that the base or support foot of the child seat can be supported securely when the stowage compartment is closed, ensuring that the child seat is then properly secured. If the stowage compartment is not secured accordingly in conjunction with a child seat with base or support foot, it could break in the event of an accident, the child could be tossed around and sustain serious injuries.